I hope here is a picture of our first zucchini this year. It tasted so good. Grilled with some meat. We were so excited yesterday to get our first zucchini. 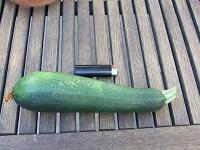 It is a zucchini squash and about 10 inches long. biggest we have had. I just hope we get lots more. We have already cooked it on the grill with bell peppers, onions, and steaks. good! The heat and lack of rain is now doing a number on my tomato plants. One is looking really healthy, the other has some dead leaves at the bottom. We have a soaker hose in the garden and put it on every night. Any suggestions on a different solution? We got about 2 1/4 inches over 3 days last weekend and the tomatoes just sprung up. Grew about 6 inches, seemed like over night. Of course, the grass in the bed grew also. I have put out Over the top, pulled until my back hurt, and still the grass is there. I have worked all day yesterday and today, putting out my flowers. I cut back on the veg garden from last year, as we are under water restrictions here. You can hand water or soaker hose, which we have in the veg garden. I have put out snapdragons, superbells, salvia, dianthus, daisies, and a few others I don't remember the names. And mother nature has just released a very good rain, but the golf ball sized hail is coming and we have a tornado just south of town. More storms coming. We'll see what the morning leaves us. Today, I'm probably going to be too tired to do all I want and need to do. We have more beautiful days during the week, but have to be at work of course. Weekends usually only have one good day, if that. 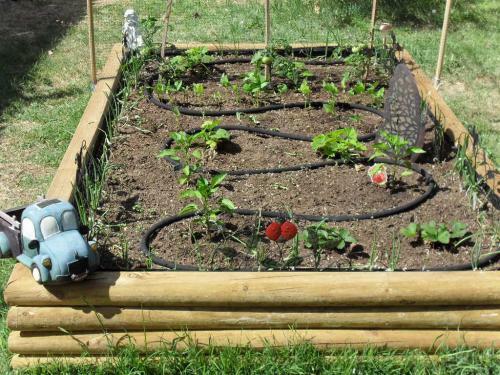 Today's plan: till the raised veg garden, put in manure, compost, cotton burrs, and admended soil and put up the wrought iron grill work for sides around tomato plants. (last part is for my husband to do). then put out the tomato plants. Next clean off potting bench area and put out some flower pots. We have large yard and have several different areas to sit and enjoy the outside. I try to make each area a little different but blend with the other areas. Once I figure out how to upload photos, I'll share. I'm luck to have a husband who enjoys the outside also.